Mother’s Day 2013 is Around the Corner! Mother’s Day is around the corner. Walking on a Cloud’s spring sale continues with many great gift ideas for Mother’s Day. Save up to 50 percent off on some of the finest shoes, from the most comfortable brands. Great styles from Geox, Ecco, and Clarks are in stock and ready to be shipped. Your mom will love them!! – Leather uppers with stich detailing. – 2 3/4 inch heel. – Removable insoles are moisture absorbent, keeping your feet cool and dry. – Stylish light weight dress shoe. – Soft leather uppers with stylish contrast stitching. – The padded insole features the Geox patented breathes® system for improved ventilation. – Dressy 2 inch wedge heel. 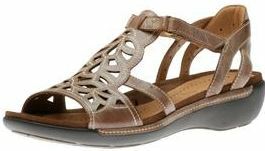 – Comfortable and versatile sandal from Geox. – Stylish patent leather uppers. – Adjustable back strap for an easy and secure fit. – The rubber outsole expels foot moisture, keeping your feet cool and dry. The new Geox Spring 2013 collection has arrived!! The new Geox Spring 2013 collection is in stock and ready to be shipped!!! Gorgeous sandals and shoes are in stock and ready to be shipped. The new spring styles feature the Geox breathes® system, which provides increased breathability and comfort. The Geox Egiziais a beautiful high heeled sandal with an open toe. 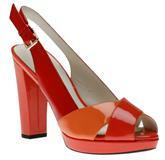 This stylish and comfortable sandal features patent leather uppers, and is leather lined. The adjustable back strap will give you a more customized fit, while the padded insole will maximize support. The Geox D Floralieis a light weight dress casual shoe, with a 3 inch wedge heel. This fabulous product features comfortable Nappa leather uppers, and soft leather lining. The Floralie features the Geox breathes® system, making this shoe waterproof and breathable.The light rubber outsole is durable and shock absorbent, which will provide all day comfort. The Geox D Lola is stylish ballerina flat. Features smooth perforated leather uppers and a dainty bow at the vamp. The Geox breathes® system will provide refreshing air circulation for those hot summer days, while the padded insole will provide cushioning for all day comfort. The rubber outsole expels foot moisture through micro holes, and the breathable membrane keeps your feet dry. The Geox D Yukiis a beautiful moccasin, with Nubuck leather uppers. The supportive footbed and the durable rubber outsole will maximize support, for those long summer walks. The D Yuki is leather lined, and features the Geox breathes® system, which will provide waterproofing and breathability. Spring 2012 is finally knocking at the door. For Rockport, this Spring is all about pushing the boundaries. From fun color mix, interesting shapes and materials to extensive technology in every step, we designed shoes to fit your life, not just your feet. At Rockport, we create style made comfortable to enable you to look good longer and enjoy summer. Have fun! The perfect look-good-feel-great combination! The TruJoris sandal not only looks cute with any summer outfit, it enables a smarter step by reproducing natural walking motion with truWALK technology. · truWALK architecture that provides a natural, full-range of foot motion, from shock absorption at heel strike to forefoot flexibility during push off. A comfy platform wedge that is perfect for summer strolls, dress it up for the office or pair it with a flirty outfit for nighttime! Look flawless and feel even better. Washable leathers and walking construction bring new life to the casual category. Famke Petal Bungie is the best ally for any trip planned this summer. Light, breathable and easy to care for, this will be the first item to pack no matter where the location. Lightness reaches new heights with this cute and fun boat shoe. Yezenia will be the perfect doorstep shoe. Wear, wash, repeat and feel good all day. Forget the schedule and have fun! Boating footwear and redesigned with the athlete in mind created the Shoreland Boulevard Collection. The new collection modernizes classic spring footwear with a sporty base. When seas get rough, innovation holds tight. On the deck or downtown, get the best! Rainboots Are Not Just for Rainy Days! Today’s rainboots come in an enormous variety of styles, colours, patterns and leg heights. They are comfortable, versatile in both looks and usage and best of all they are trendy! 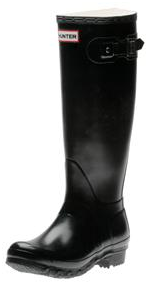 You can find Wellies for every style and need. Built for rain, slush or snow they are perfect for our Canadian weather. The Hunter Wellies, which remain a popular choice, are made from natural rubber and feature a calendared rubber outsole to help keep you on your feet. They are lightweight and comfortable with an fit. The traditional “Hunter Original Tall” continues to be our top seller, however, their newest styles include boots with laces, patterns and even ballet flats. Keep your toes toasty warm and transform the look of your Original boots by adding one of their colourful fleece Welly Socks topped with knitted cuffs, fleece or faux fur. BOGs is also another hot brand in the marketplace. Their funky patterns set them apart from the rest and will allow the more daring to stand out in the crowd. For the more conservative crowd you can also find our BOGs in a variety of solid colours. BOGs describes their footwear as the “all-weather boot”. Every boot is built with BOGs Climatech™ Technology and made with durable, hand-lasted rubber to enhance the fit of the boot and provide the ideal internal climate. Styles offer comfort ratings as low as -40 temperatures to beat the winter cold. 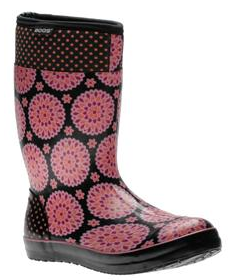 BOGs Taylor D – PinkAnd of course, all rainboots at Walking on a Cloud are waterproof and make the promise to keep your feet warm, dry and comfortable!